Flow Cytometric Detection of Newly-formed Breast Cancer Stem Cell-like Cells After Apoptosis Reversal Yiyue Xu1,2, Chun So1, Hon-Ming Lam1,2, Ming-Chiu Fung1,2, Suk-Ying Tsang1,2,3,4 1School of Life Sciences, The Chinese University of Hong Kong, 2State Key Laboratory of Agrobiotechnology, The Chinese University of Hong Kong, 3Key Laboratory for Regenerative Medicine, Ministry of Education, The Chinese University of Hong Kong, 4Centre for Novel Biomaterials, The Chinese University of Hong Kong Here, we present a protocol to isolate apoptotic breast cancer cells by fluorescence-activated cell sorting and further detect the transition of breast non-stem cancer cells to breast cancer stem cell-like cells after apoptosis reversal by flow cytometry. A Familial Hypercholesterolemia Human Liver Chimeric Mouse Model Using Induced Pluripotent Stem Cell-derived Hepatocytes Jiayin Yang*1,2,6, Lai-Yung Wong*2, Xiao-Yu Tian*3, Rui Wei1,2, Wing-Hon Lai2, Ka-Wing Au2, Zhiwei Luo4,5, Carl Ward4,5, Wai-In Ho2, David P. Ibañez4,5, Hao Liu4,5, Xichen Bao4,5, Baoming Qin4,5, Yu Huang3, Miguel A. Esteban4,5,7, Hung-Fat Tse1,2,6,7 1Department of Medicine, University of Hong Kong-Shenzhen Hospital, 2The Cardiology Division, Department of Medicine, Li Ka Shing Faculty of Medicine, University of Hong Kong, 3School of Biomedical Sciences, Institute of Vascular Medicine, Li Ka Shing Institute of Health Sciences, Chinese University of Hong Kong, 4Key Laboratory of Regenerative Biology of the Chinese Academy of Sciences, Joint School of Life Sciences, Guangzhou Institutes of Biomedicine and Health and Guangzhou Medical University, 5Laboratory of RNA, Chromatin, and Human Disease, CAS Key Laboratory of Regenerative Biology and Guangdong Provincial Key Laboratory of Stem Cells and Regenerative Medicine, Guangzhou Institutes of Biomedicine and Health, Chinese Academy of Sciences, 6Research Centre of Heart, Brain, Hormone, and Healthy Ageing, Li Ka Shing Faculty of Medicine, University of Hong Kong, 7Hong Kong-Guangdong Stem Cell and Regenerative Medicine Research Centre, University of Hong Kong and Guangzhou Institutes of Biomedicine and Health Here, we present a protocol to generate a human liver chimeric mouse model of familial hypercholesterolemia using human induced pluripotent stem cell-derived hepatocytes. This is a valuable model for testing new therapies for hypercholesterolemia. Magnetic-Activated Cell Sorting Strategies to Isolate and Purify Synovial Fluid-Derived Mesenchymal Stem Cells from a Rabbit Model Zhaofeng Jia1,2,3, Yujie Liang4,5, Xingfu Li2,3, Xiao Xu1,2,3, Jianyi Xiong2,3, Daping Wang1,2,3, Li Duan2,3 1Postgraduate institution, Guangzhou Medical University, 2Guangdong Provincial Research Center for Artificial Intelligence and Digital Orthopedic Technology, 3 This article presents a simple and economic protocol for the straightforward isolation and purification of mesenchymal stem cells from New Zealand white rabbit synovial fluid. Determination of the Excitation and Coupling Rates Between Light Emitters and Surface Plasmon Polaritons Zhaolong Cao1,2, Min Lin2, Daniel Ong2 1State Key Laboratory of Optoelectronic Materials and Technologies and Guangdong Province Key Laboratory of Display Material and Technology, School of Physics and Engineering, Sun Yat-sen University, 2Department of Physics, The Chinese University of Hong Kong This protocol describes the instrumentation for determining the excitation and coupling rates between light emitters and Bloch-like surface plasmon polaritons arising from periodic arrays. Detecting Anastasis In Vivo by CaspaseTracker Biosensor Ho Man Tang1,2, Ming Chiu Fung2, Ho Lam Tang3 1Institute for Basic Biomedical Sciences, Johns Hopkins University School of Medicine, 2School of Life Sciences, Chinese University of Hong Kong, 3Department of Neurosurgery, Johns Hopkins University School of Medicine Anastasis is technically challenging to detect in vivo because the cells that have reversed the cell death process can be morphologically indistinguishable from normal healthy cells. Here we describe protocols for detecting and tracking cells that undergo anastasis in live animals by using our newly developed in vivo CaspaseTracker biosensor system. A Novel Feeder-free System for Mass Production of Murine Natural Killer Cells In Vitro Patrick Ming-Kuen Tang1,2, Philip Chiu-Tsun Tang2, Jeff Yat-Fai Chung2, Jessica Shuk Chun Hung2, Qing-Ming Wang2, Guang-Yu Lian2, Jingyi Sheng2, Xiao-Ru Huang2, Ka-Fai To1, Hui-Yao Lan2 1Department of Anatomical and Cellular Pathology, The Chinese University of Hong Kong, 2Li Ka Shing Institute of Health Sciences and Department of Medicine & Therapeutics, The Chinese University of Hong Kong Here, we present a protocol to mass-produce gene-silencing murine NK cells by using a feeder-free differentiation system for mechanistic study in vitro and in vivo. Using Retinal Imaging to Study Dementia Victor T.T. Chan1, Tiffany H.K. Tso1, Fangyao Tang1, Clement Tham1, Vincent Mok2,3,4, Christopher Chen5,6, Tien Y. Wong7,8, Carol Y. Cheung1 1Department of Ophthalmology and Visual Sciences, The Chinese University of Hong Kong, 2Department of Medicine & Therapeutics, The Chinese University of Hong Kong, 3Therese Pei Fong Chow Research Centre for Prevention of Dementia, The Chinese University of Hong Kong, 4Gerald Choa Neuroscience Centre, The Chinese University of Hong Kong, 5Memory Aging and Cognition Centre, National University Health System, 6Department of Pharmacology, National University of Singapore, 7Singapore Eye Research Institute, Singapore National Eye Centre, 8Duke-NUS Medical School, National University of Singapore The retina shares prominent similarities with the brain and thus represents a unique window to study vasculature and neuronal structure in the brain non-invasively. This protocol describes a method to study dementia using retinal imaging techniques. This method can potentially aid in diagnosis and risk assessment of dementia. A 5-mC Dot Blot Assay Quantifying the DNA Methylation Level of Chondrocyte Dedifferentiation In Vitro Zhaofeng Jia1,2, Yujie Liang3, Bin Ma4,5, Xiao Xu2,6, Jianyi Xiong2, Li Duan2, Daping Wang1,2 1Guangzhou Medical University, 2 We present a method to quantify DNA methylation based on the 5-methylcytosine (5-mC) dot blot. We determined the 5-mC levels during chondrocyte dedifferentiation. This simple technique could be used to quickly determine the chondrocyte phenotype in ACI treatment. 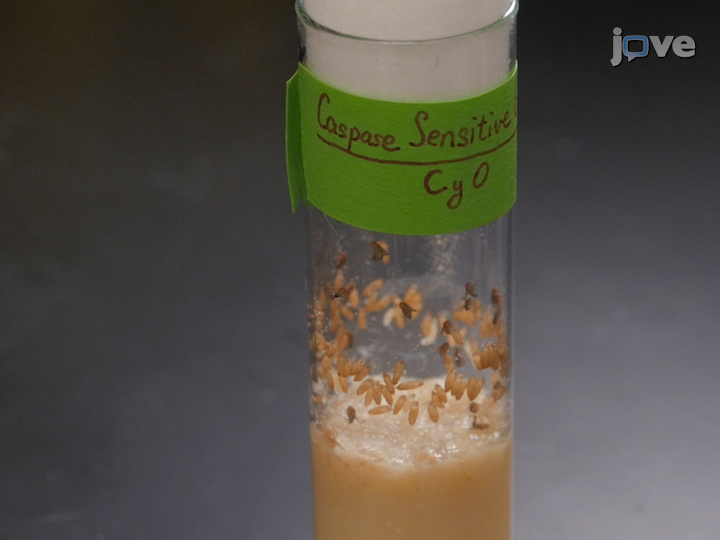 In Vivo Biosensor Tracks Non-apoptotic Caspase Activity in Drosophila Ho Lam Tang1, Ho Man Tang1, Ming Chiu Fung2, J. Marie Hardwick1 1W. Harry Feinstone Department of Molecular Microbiology and Immunology, Johns Hopkins University Bloomberg School of Public Health, 2School of Life Sciences, Chinese University of Hong Kong To detect healthy cells in whole animals that contain low levels of caspase activity, the highly sensitive biosensor designated CaspaseTracker was generated for Drosophila. Caspase-dependent biosensor activity is detected in long-lived healthy cells throughout the internal organs of adult animals reared under optimized conditions in the absence of death stimuli. Strategies for Tracking Anastasis, A Cell Survival Phenomenon that Reverses Apoptosis Ho Lam Tang1,2,3, Ho Man Tang1,2,3, J. Marie Hardwick1, Ming Chiu Fung2 1W. Harry Feinstone Department of Molecular Microbiology and Immunology, Johns Hopkins University Bloomberg School of Public Health, 2School of Life Sciences, Chinese University of Hong Kong, 3Center for Cell Dynamics, Department of Biological Chemistry, Johns Hopkins University School of Medicine The term anastasis refers to the phenomenon in which dying cells reverse a cell suicide process at a late stage, repair themselves, and ultimately survive. Here we demonstrate protocols for detecting and tracking cells that undergo anastasis.